This blood sugar "roller coaster" is rooted in a belief in the mainstream medical community and diabetes organizations that carbohydrates should make up between 45-65% of daily calories. They try to hide this with vague language, but the 2017 medical recommendations from the American Diabetes Association specifically says 15-20% of calories should come from protein, and 20-35% of calories should come from fats. That means the balance of calories (45-65%) come from carbohydrates. See page S36 of this document. Worse, for those who take insulin injections, the large doses of insulin that have to be given to match high blood sugar spikes can result in low blood sugar (hypoglycemia) episodes which are incredibly dangerous, since hypoglycemia can cause a loss of consciousness or death if the brain runs out of glucose. If a person is keto-adapted, meaning insulin levels are normal, than the body is able to make ketones to supplement brain fuel stores between meals. If a body is keto-adapted, then the brain only needs about 50 grams of carbohydrate/day, and that can easily come from gluconeogenesis. So the difference is in the primary fuel supply – carbs or fat. In my opinion, the sensible approach to managing blood sugar safely is to stop eating foods which drive up blood sugar. It’s what Dr. Richard K. Bernstein in his book The Diabetes Solution calls the Law of Small Numbers: eating small amounts of carbohydrate results in the need for less insulin. Smaller does of insulin result in fewer episodes of dangerous low blood sugar or hypoglycemia. People with diabetes have a choice to become more effective in their diabetes treatment, no matter what causes the diabetes. They can start a low carb, high fat diet, limit carbohydrate intake to more reasonable and healthy amounts, and effectively stop the blood sugar roller coaster. Blood sugars highs will be greatly reduced and having higher blood ketone levels allows the brain to access an alternative fuel when blood sugar is too low. This means freedom from the symptoms of hypoglycemia. A ketogenic diet treats diabetes at the root cause, and is a much safer, more effective plan than injecting insulin to counteract the consumption of high carb foods. This is true for both type 1 and type 2 diabetics. A recent paper by Feinman et al lays out the science supporting the obvious choice of a low carbohydrate diet for diabetics. Lower high blood sugars and stabilize average blood sugar levels: keeping blood sugar low and at even levels throughout the day reduces the organ damage done by high blood sugar levels. Your doctor may track this with an Hemoglobin A1C or HbA1c test. This test is a measure of your average blood sugars over a 3-4 month time period. Reduce the need for large influxes of insulin: lowering insulin levels reduces the inflammatory damage which uncontrolled insulin causes to the coronary vascular system. This reduces the risk of the heart disease issues so commonly associated with diabetes. This can be tracked with a fasting insulin test, although doctors don’t usually order this test. Controlling diabetes and managing blood sugar levels is not an easy task. It involves serious lifestyle and psychological changes, and newly diagnosed diabetics don’t always get the correct information they need to make the best decisions. For example, identifying and switching to the most effective diabetic diet is a challenge because as mentioned, a diet high in carbohydrates makes blood sugar control very difficult. Maybe the ADA recommends a higher carb diet because they don’t want to be responsible for deadly hypoglycemic episodes. But over time, high blood sugar condemns those with diabetes to diabetic complications instead. 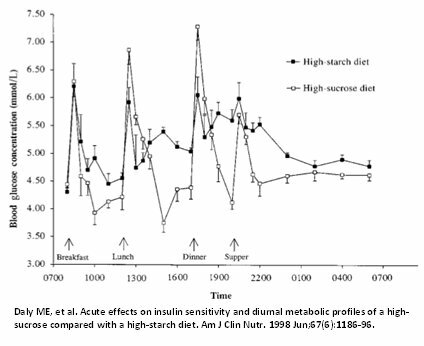 Restricting dietary carb intake results in improved blood sugar control and insulin levels, and in addition, has been shown to improve the health markers for heart disease and metabolic disorders. And the effects can be maintained. This study followed a group of type 2 diabetics for almost two years, showing that improved blood sugar control with a low carb diet was possible over the long term. Here’s another long term study with positive results on diabetic blood sugar control. And this more recent study shows that a very low carb, ketogenic diet is even more effective. This study provides similar results for those with type 1 diabetes. For more information on using a low carb, high fat diet as a diabetes treatment plan, check out the new book on type 2 diabetes that I’ve written with Dr. Keith Runyan, a type 1 diabetic himself. We also wrote a book on Type 1 diabetes as well. He uses a ketogenic diet to keep his HbA1c at 5.0, and he has a lot to say about why the diet is the best choice for those with diabetes. Here’s a great presentation on how Type 2 diabetes can be reversed with a low carb, high fat diet from Dr. Sarah Hallberg.